← Boy have we got a nice little number of New Arrivals…including BOY! The last remaining Defender of Rock & Roll…actually it’s just the box with Jammer balloons inside. Sound Opinions has asked us to be a part of their showing of High Fidelity on October 24 at the Music Box Theater. We are truly grateful to be asked. Many of you may know that we have always been connected to the filming of High Fidelity…in spirit…and literally. Many people ask or mistakenly blog that this is where the film was shot. It was NOT…take that interweb. It was shot in a store front at Milwaukee and Honore that was set up as Championship Vinyl. Our store which was part of 2nd Hand Tunes back then provided some of the bins and record stock and I believe the cash register. 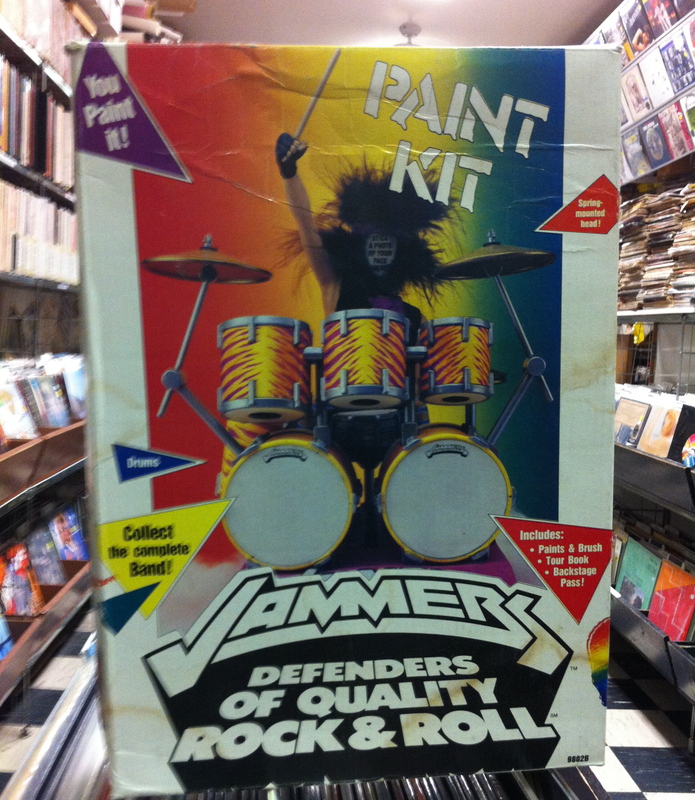 However, many do not know that in the back store room of Championship Vinyl lurks a couple of boxes of the legendary Defenders of Quality Rock & Roll…JAMMERS!! If you look behind John Cusack when he is on the phone there is a shelf with boxsets and poster rolls and below those are…JAMMERS! YIKES! Memory burn for all former 2nd Hand Tunes employees as we sold a buttload of these funky paint-it-yourself plastic monstrosities. Many, many people bought them and if you have one still and want to post it up here that would be cool. If you haven’t painted yours yet…GET GOING. The paint is probably still good. It’s like the gum in TOPPS baseball cards. It has a shelf life that doesn’t change it’s consistency. 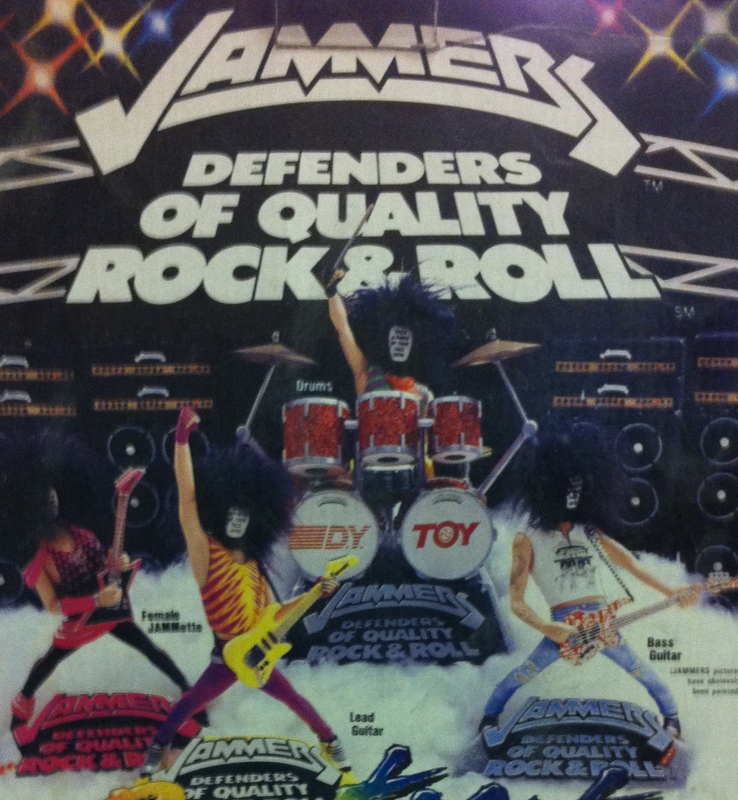 Little known fact about JAMMERS-the Bass Player was never made. The last supplies of JAMMERS were purchased from the garage of the creator…at least I think that’s true. So if you are at the Sound Opinions showing you will notice those JAMMERS defending the stock room. SEE YOU THERE and don’t forget to follow our Twitter feed and our FB page for info as to how you can win one of 3 Pairs of tickets that Sound Opinions has graced us with…JAM ON IT! The Lead Guitar, The Drummer, and The Female JAMMette all exist…the Bass Player is only a figment of your imagination. The sign on the door says it all- NO CD’s!! Never had ‘em!! Never Will!! Dave’s is totally devoted to vinyl. We carry all speeds (33,45,even 78) all formats (7”, 10”, 12” single, EP , LP) all styles (rock, jazz, soul, funk, hip hop, house, disco, reggae, blues, folk, country, vocal, soundtracks, showtunes, classical, indie/alternative and every sub-genre you can imagine). If it’s on vinyl, it’s here now or it’s passed through our doors and in to someone’s crate. On any given day, there are at least 40,000 titles to choose from. Every day new titles freshen the racks. We sell both new and used. You’ll find both import and domestic new vinyl. You’ll find a wide assortment of new reissued vinyl. You’ll find out of print used vinyl that you’d thought was long gone. No matter what it is, you’re likely to find it in our bins. If you come to Chicago, check us out. If you can’t, e-mail us and we’ll try to hook you up. Not everyone has a great vinyl store within reach.